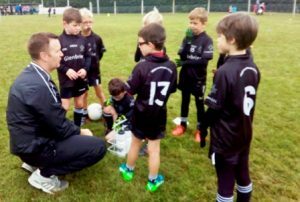 Walterstown GFC U8’s reach St Ultans/Cortown Gaels Cup Final 2018. Congratulations to our Walterstown GFC U8’s who reached the St Ultans/Cortown Gaels Cup Final 2018 at the weekend. Over two days the boys played some fantastic football with great skill and teamwork on show. They played 5 games over the weekend in some tough conditions and won all 5 games in the group competition which sent them to the Cup final against the hosts on Sunday. The final was a well contested game with St Ultans edging out Walterstown. Congratulations to both teams on a great game. Thank you to Derek O’Brien and St Ultans/Cortown Gaels for hosting the 2 day event. The event was very well organised. We look forward to returning next year. Finally thank you to all the parents for all their help in getting the boys to the event and also a big thank you to Ciaran and Brenda Reilly for the Ice Creams at the end of the tournament. It was a lovely way to end the weekend with all the boys sitting around chatting about the games.